These tea bags are filled with freshly dried herbs and fruits to shine your hair, refresh tired eyes, and cleanse your skin. 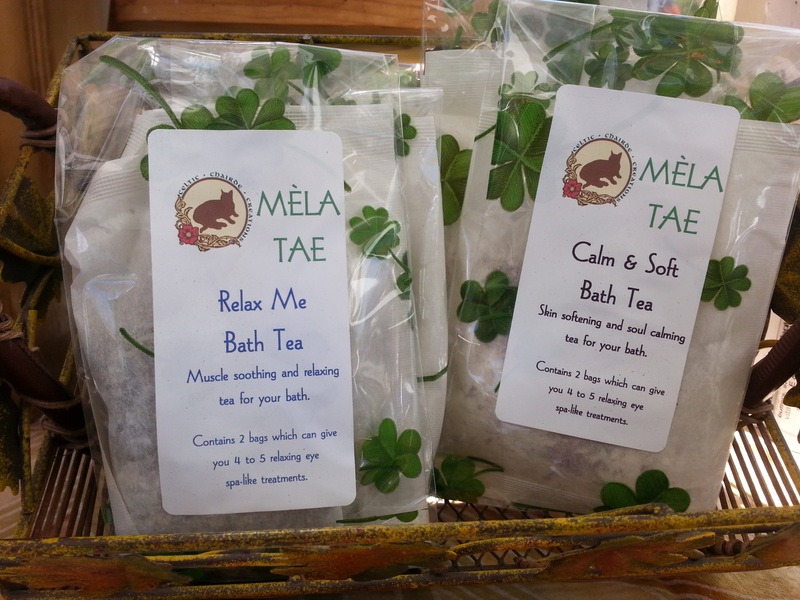 Our new Bath Teas will help you relax and soothe your tired soul and muscles. Relax and rest your tired eyes with a soothing tea bag compress. Eye Bright and Cucumber refresh and restore while reducing puffiness. Contains 5 small bags that can each be used twice. Throw this tea bag into a big bowl of hot water and let the herbal steam cleanse and purify your skin. Tea is so soothing - especially spa teas made to sooth, cool, freshen and treat your outsides! 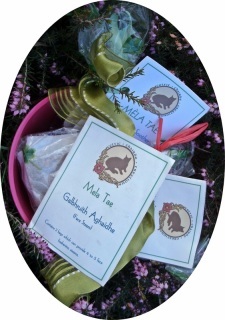 This Méla Tea Set includes one each of our fabulous all natural, herbal tea bag packs. You can use each tea bag 2 or 3 times - so this is a real value as well as a wonderful mini-spa treat for yourself or a friend. 1 Galbhruith Aghast Fresh Face Steam Tea - this blissful combination cleanses and purifies cold weather weary skin. 1 Eyebright Soothers - Eyebright, heather and other herbs are blended with dried cucumber to help cool and refresh while reducing puffiness. 1 Hair Rinse - Choose Lemon Bright for light colored hair or Night Moon for dark hair. This herbal blend brings our natural brightness and shine without coloring your hair. The hair rinse features lemon, lemon verbena, chamomile to bring out lighter highlights in your hair. The hair rinse here features rosemary and strawberry so bring out the dark highlights in your hair. * Hair Rinse Mela Tae's will not change the color or your hair. If you color treat your hair, try a small under section first to assure that the herbs won't react with the hair coloring.